#AmphibianHero – Joshua Ralph (MantellaMan Conservation) Interview with the Amphibian Survival Alliance. An interview with Joshua Ralph, Batrachologist and Conservationist with MantellaMan Conservation, an Amphibian Survival Alliance Partner. Amphibians the world over are facing probably the world’s most serious extinction crisis. What are your thoughts on the future prospects for amphibian conservation and preventing further extinctions? Personally, I find it isn’t entirely productive thinking of what is going to happen or what might happen and you can get lost in the depressing state these animals are in. Instead, looking at the now, the present is more productive… You can’t change the past (unless you’re Marty McFly), but you can change the future with what we do now and how quickly we act to slow down or hopefully, halt the extinctions of hundreds of species. I won’t deny, I see it like wading through a swamp, every step you take can make you anxious and fill with dread, not knowing if your next step is going to make you sink lower or rise above it. But, if we all work together I think we can get through it, make changes and save some species before they are lost forever to the abyss that is, extinction. What do you think are some of the most promising developments in the fight to prevent further amphibian population declines? 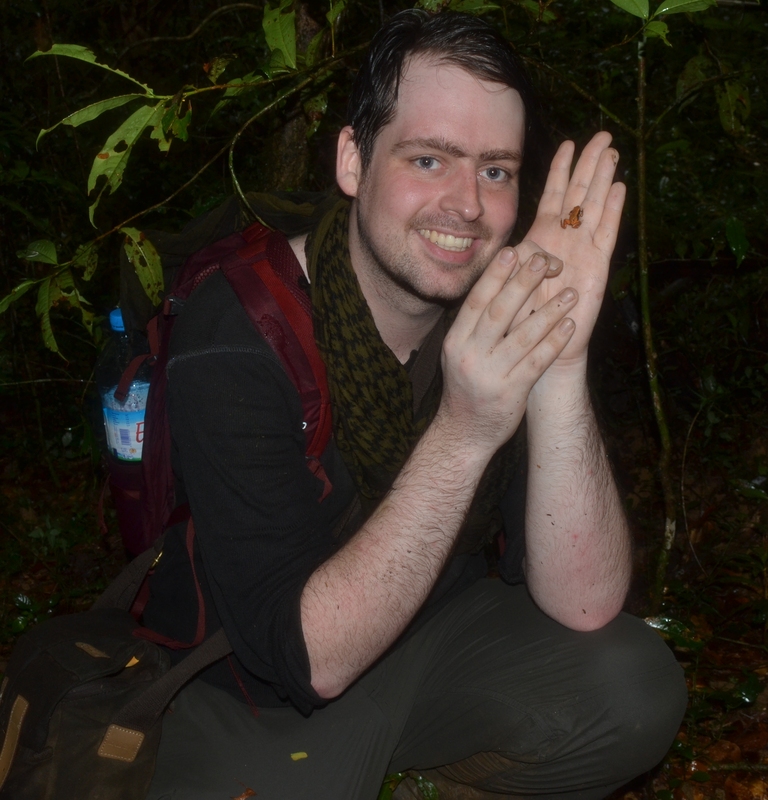 Joshua Ralph (MantellaMan) in the Bakozetra locality of the Torotorofotsy Wetlands Reserve with a Yellow Eastern Mantella (Mantella crocea) specimen. © 2015 – Joshua Ralph – All Rights Reserved. Some of the most promising? There are already so many developments in the world that deserve recognition and I think one great example is the Amphibian Survival Assurance Centre of Andasibe facility at Association Mitsinjo. This isn’t just because of the successful conservation breeding of some of the country’s most threatened species of Amphibia, but also for the changes they have made to some of the local towns folk in the region, most of which it has changed their lives entirely. Some of the staff members at the facility have contributed, in the past, to the decline of certain species of Amphibia but now they are maintaining breeding colonies of threatened species at Association Mitsinjo, performing screenings for Chytridiomycosis in the local areas and most of all, showing others how important it is to maintain their country’s wildlife. Another development that I think is highly promising, regarding the future of our planets Amphibia, is the increase of the public’s awareness of the demise of these fascinating and beautiful form of life. With social media, awareness events and even in educational curriculums people are becoming more and more aware not only of the risks these animals face, but also about some of the behaviours exhibited and the vast biological diversity that can be found which needs saving. Why did you join the Amphibian Survival Alliance and what are you doing to help protect amphibians? We joined the ASA to try and make a contribution to the hard work they are already performing and raise even more awareness regarding the demise Amphibian life across the globe with a particular focus on Madagascar, the “island of marvels” as I like to call it. MMC is dedicated to trying to raise awareness in any way possible, from performing educational talks to writing informative blogs and sharing information. But it has also been created to perform work in situ, by offering help at facilities such as the one found in Andasibe with the husbandry and breeding of these threatened species or even performing research that could itself make a difference. What can the average person, as well as the private sector, do in order to tangibly and actively participate in amphibian conservation? Keep on raising awareness, by sharing information even you, yourselves have learnt about regarding these animals and with social media such as Facebook and Twitter, it isn’t exactly difficult to do so. It takes a mere click to share something or but a few moments to have a read into a certain topic. It doesn’t matter who you are, what age you are, what religion you believe in, you can make a difference no matter how small you believe it to be by continuing to spread information to your family, friends, colleagues and so on. Previous PostOrchids of Madagascar (Andasibe Region)Next PostDiurnal Hike at Mitsinjo (Analamazoatra) Forest Station – Video.